This ugly Christmas sweater worksheet gets your kid to celebrate the good, bad, and ugly of Christmas cheer! Christmas is a time for family, giving, and most importantly, ugly sweaters! Get into the Christmas spirit with this wacky drawing activity. Come up with your own ugly Christmas sweater design. To make it extra fun, print out a bunch and turn it into a contest. Design and draw your ideal ugly Christmas sweater this holiday season! To connect the dots on a more attractive Christmas sweater, try this dot-to-dot worksheet. Practice spelling Christmas words with this challenging crossword puzzle. This paper gingerbread house is a sweet holiday craft, without the sticky mess. Make a paper gingerbread house with your little architect this holiday season. Your third grader will have fun figuring out clues with this colorful crossword puzzle all about Christmas! She'll even sneak in some handwriting practice too. This Christmas color by number will sweeten your holiday festivities. Try our Christmas color by number with your child between opening gifts and family dinner. Have fun celebrating the winter holiday season with a Christmas word search! This will help strengthen your child's vocabulary and spelling skills. Do some gingerbread house coloring with this festive holiday worksheet. 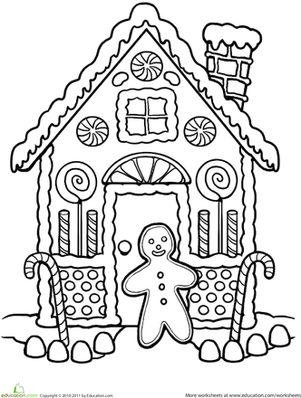 Try this gingerbread house coloring worksheet with your child this Christmas season.